George Graham Reviews Matt Flinner's Latitude"
New Acoustic music got its start in the late 1970s and early Eighties when younger musicians raised on rock and other more contemporary styles gravitated toward bluegrass instrumentation, began to throw out some of the traditions and to mix influences with abandon. David Grisman is probably the best known and most influential musician in the movement, though Tony Rice, Sam Bush and the members of New Grass Revival, and later Béla Fleck made some fascinating music with the style, combining virtuosic playing with a jazzy sense of harmony and rhythm. At first, it raised the hackles of the traditionalists, but the influence of that jazzy style of playing, and the impressive level of musicianship that these pickers brought to their music has by now permeated bluegrass, and raised the quality of the playing throughout the style. Fleck and others also composed a lot of really interesting music for their acoustic instrumentation. They didn't just get into fast jazzy improvisational jams. While Fleck has gone electric for much of the time, Grisman and others remain active on the acoustic scene, though the frequency of album releases in the style is not what it used to be. This week we have a fine new recording in the classic New Acoustic style, if that is not an oxymoron. 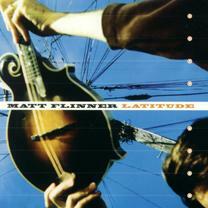 It's the second album by mandolinist Matt Flinner, entitled Latitude. Flinner, like Béla Fleck, started as a banjo prodigy, appearing at national-level folk festivals before his teens. Then he switched to mandolin, and took the prize for his playing that instrument at the Winfield, Kansas, folk festival the year after he won on banjo. On mandolin, Flinner became part of the active Colorado bluegrass scene as a member of the eclectic group Sugarbeat, who were known to include songs by Sting in their repertoire. Sugarbeat also included some other figures who are rising stars on the New Acoustic scene, including Ben Demerath and Tony Furtado. Currently, Flinner performs as part of the Judith Edelman Band, but in 1998, Flinner made his debut recording called The View from Here, which attracted a good deal of praise from critics. Now he is out with Latitude and he continues his exploration of boundary-crossing instrumental acoustic music, this time with more of an emphasis on multi-faceted compositions, most of which have short solos, rather than a lot of fancy picking. He is joined by two musicians with whom he regularly plays as a trio, bassist Todd Phillips, who cut his teeth with David Grisman, and guitarist David Grier, who has made some fine New Acoustic instrumental recordings of his own. They are joined by Jerry Douglas, the ubiquitous Dobro virtuoso, and fiddlers Darol Anger, another charter David Grisman Quintet member, and Stuart Duncan, ubiquitous player on New Acoustic recordings from Nashville. Latitude is a rather subtle recording. If you are looking for hot bluegrass picking, you won't find a lot of it here. The musicianship is indeed superb, but it more often takes the form of the interaction with the other players and the fine performances of the interesting compositions that Flinner created, which range in influence from straight bluegrass to jazzy to Celtic to almost classically melodic. The album also has a decidedly intimate sound, with a few tracks scaled back to a trio with just the mandolin, bass and one other instrument. Matt Flinner's new album Latitude is an impressive recording that is in the best New Acoustic tradition, marked by fine musicianship but also by impressive composing. Flinner, like Béla Fleck, believes in putting as at least much effort into the writing of interesting and challenging pieces, as into the virtuosic performances by some of the best pickers on the planet in their style. It makes for an album that can be appreciated both for its pleasing overall mood, and for the subtle musical richness that it offers to those giving it their full attention. The CD is also impressive for its sound quality, along with a distinctive recording technique. The instruments are closely miked and recorded without any studio effects, including reverberation, which imparts an uncommonly intimate sound that enhances the feeling of personal interaction between the players, and brings the listener right into the gathering. Over nearly two decades, the New Acoustic scene has explored a lot of musical territory with non-amplified instruments. Mandolinist Matt Flinner helps to break a bit of a lull in the style with a very classy new CD.